Tis’ the season to be jolly and Worldhotels is inspiring all their guests to celebrate the season of giving, by gifting their loved ones the most precious festive present of all – quality time spent together. Offering an array of enticing travel destinations with invitingly festive experiences to boot, guests now have the luxury of ushering in Christmas and the New Year at a magical destination of their choice. For hotel stays from now to February 28th, 2017, guests can save up to 20 per cent off Best Available Rate for stays of two nights or more. This rate also includes breakfast and either 500 frequent flyer miles or loyalty points from Worldhotels’ Peakpoints programme. Guests may now book ‘Celebrate Differently’ via www.worldhotels.com/special-offers/celebrate-differently-promotion-2016 as well as from any other Worldhotels booking channels. Treat your children and yourself to a fun-filled Christmas this 2016 by visiting the enchanting Disneyland Tokyo. Not only will guests marvel at the entire park being decked out in Christmas decorations, they can also expect to witness their favourite Disney characters come to life at the annual Christmas parade – boasting seven whimsically furnished floats and over 100 devoted performers. Guests can choose to stay at Dai-ichi Hotel Tokyo to gain quick access to Disneyland Tokyo as the hotel is only 30 minutes away. Room rates start at USD 201. This winter, brave the cold with your loved ones in Seoul and visit one of the best ice-skating and sledding destinations in the Asia Pacific region. Allow Lotte Hotel Seoul, Downtown to play host this festive season as the property is situated a mere250m away from the renowned Seoul Plaza Ice Skating Rink. Guests can travel to Yeouido Hangang Park if they prefer to go sledding as it features both beginner and intermediate slopes for all to enjoy this all-time favourite winter pastime. Room rates start at USD 151. Phuket, Thailand, is heralded as one of Asia’s most phenomenal party scenes in recent years and Christmas is no exception despite the tropics. With the city centre being a mere 15-minute drive away, avid party-goers will never go wrong withchoosing to stay at Amatara Wellness Resort. Guests can literally be partying the night away in one moment and be back inthe privacy of their villas before they realise it. What’s more is that the resort is recognised for its wellness programmes and spa treatments, so guests can indulge and pamper their bodies after a night out partying and rejuvenate themselves just in time for the following night’s rave. Room rates start at USD 400. Christmas will never be the same without first visiting a quaint Christmas market, and one of the best festive markets anywhere in the world lies in the city of London. 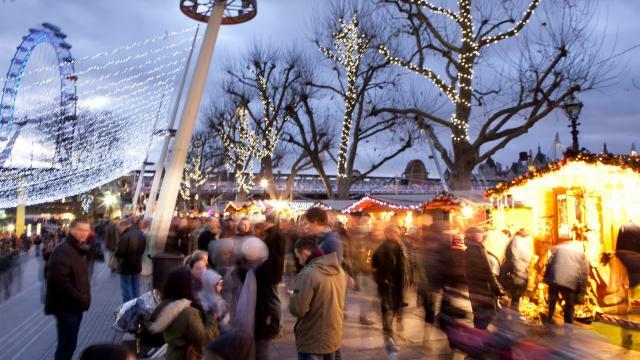 Guests will find more than just gingerbread and baubles in the 50 wooden chalets that make up the Southbank Centre Christmas Market. With the aroma of mulled wine and minced pies coupled with the sight of intricate handmade wooden crafts, it is safe to say that the Christmas spirit is in the air at this London market. Guests have the option to stay at The Washington Mayfair Hotel, which is conveniently located 15-minutes away from this magical Christmas market via the Tube. Room rates start at USD 176. December absolutely abounds with ample opportunities to catch the Nutcracker in New York City, so dance enthusiasts and Christmas fanatics can celebrate the wonder and joy of the festive season and pay homage to the city that never sleeps. Whether it is attending a modernised hip-hop rendition of the play or witnessing Tchaikovsky’s iconic score coupled with the elegance and grace of the New York City Ballet, The Nutcracker is assured to whisk everyone away on a most heartwarming Christmas adventure. Guests can stay at Roger Smith Hotel which is a short 12-minute drive away from the latter of the two plays. Room rates start at USD 174. Hope this helps with your Christmas holiday planning…..somewhat..
WOW The rooms look AMAZING! Wish I could stay in at least one of them.